The Chad Valley Old McDonald had a Zoo Soundbook tells the tale of the infamous old McDonald and how he has progressed to owning a fabulous zoo as well as his farm! This shaped board book complete with sounds is a remix mix up nursery rhyme sure to delight little ones. 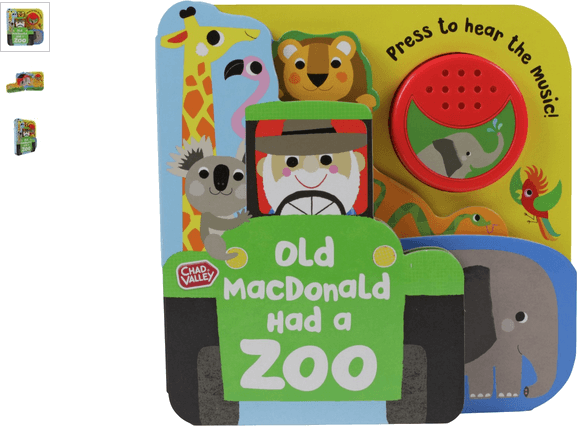 Get money off with April 2019 free Argos voucher codes, see if there's a promo code for the Chad Valley Old McDonald had a Zoo Soundbook product. Argos may be out of stock of this product. To enhance your shopping experience you may also be redirected to a search results page when you click an outbound link. 4.0/5 from 2 recent reviews.